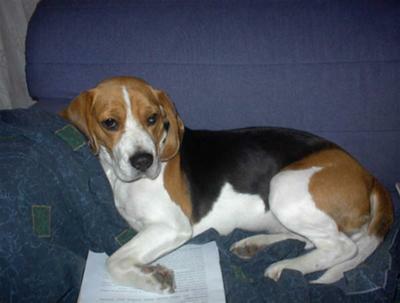 Evita was my very sweet beagle. She was born on Sept 19 2001 in Hungary, and my parents brought her home on Jan 9th 2002. I've been asking to have a puppy for such a long time and when I first saw her in my step dad's hand I immediately fell in love with her. We realized that we are going to have a lot of trouble with her because she was a very naughty dog but she brought a lot of joy into my family... well not counting the fact that she ate our furniture and my mom's brand new red italian shoes. I am not sure how she died but most likely from the heat because it was too hot outside and this makes me feel so guilty and upset that she had to die because they were not paying attention to her. She wasn't supposed to die yet she was only 8 years old. I'm writing this because I feel so angry inside that why couldn't they just take her inside the house if it was so hot outside or something. But I guess there is no point of thinking about the 'what ifs', they won't bring her back to life so now I can only hope that she is in a better place now.